Hotel Europa is located 200 meters from the Slovakian border and the airport. The architectural ensemble of the hotel is designed in a modern European style. The hotel rooms meet European standards. 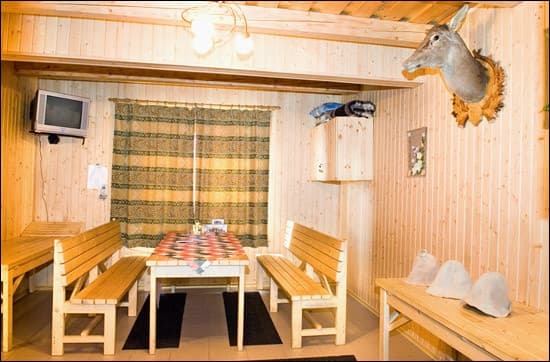 Hotel "Europe" also offers wooden cottages for families and companies. All cottages with their own terraces and all amenities. On the 1st floor there is a cozy lounge and restaurant hall, the menu of which offers European and national cuisine. There is a banquet hall for 170 people and a VIP room for 18 people. In the courtyard of the hotel in the open air there are separate pavilions for resting companies, as well as Russian baths, massage services and an open-air swimming pool. The hotel is 1.5 km from the city center, and 3 km from the railway station. Description of the room: Junior suite with a French bed, with the possibility of an extra bed. 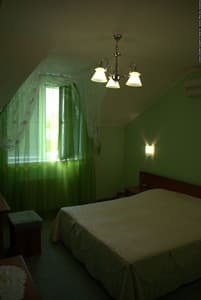 The rooms are bright, cozy, spacious with all the necessary attributes for a comfortable stay, meet European standards, are equipped with air conditioning, an internal telephone and Wi-Fi Internet, there is a TV, a coffee table and a wardrobe. Description of the room: Cozy double rooms with twin beds or French beds, with the possibility of an extra bed. 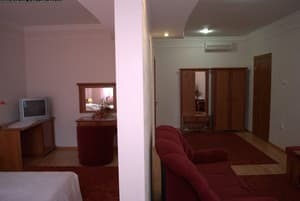 The rooms meet European standards, are equipped with air conditioning, an internal telephone and Wi-Fi Internet, there is a TV, a coffee table and a wardrobe. Room rate for single accommodation - 585 UAH. Description of the room: The cozy room is equipped with one double bed. The rooms meet European standards, are equipped with air conditioning, an internal telephone and Wi-Fi Internet, there is a TV, a coffee table and a wardrobe. 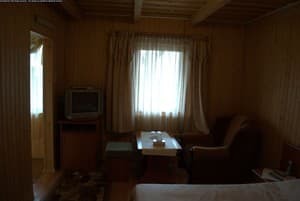 Description of the room: Wooden cottages 2-bed with the possibility of an extra bed, cozy room, with a balcony and overlooking the Alpine hills. 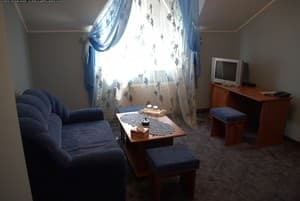 The rooms meet European standards, are equipped with air conditioning, an internal telephone and Wi-Fi Internet, there is a TV, a coffee table and a wardrobe. Description of the room: Suite with a French bed, with the possibility of an extra bed. 2 spacious and cozy rooms provide you a comfortable stay. The room has a sofa, TV, coffee table, wardrobe. The cost of additional space is 250 UAH / person. 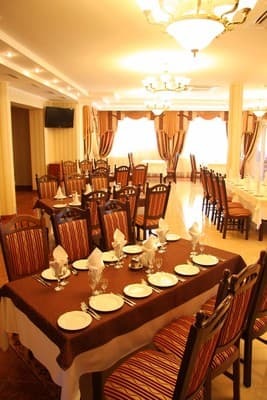 On the 1st floor there is a restaurant, in the menu is European and national cuisine. 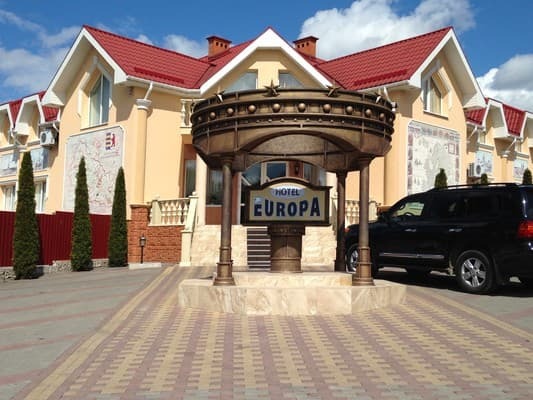 Hotel Europa is located in the administrative, commercial and business center of Transcarpathia - Uzhgorod, 3 km from the railway station, 200 m from the Uzhgorod airport and 1.5 km to the city center. To the first ski lifts 80 km, Mount Krasia. From the railway and bus stations 3 km (it is best to take a taxi), and from the airport only 200 meters. For guests with their own transport: if to enter from Hungary - on the bypass road in the direction of the Slovak border. Do not reach the border - turn left. From the direction of Mukachevo (Kiev direction) - not entering the city on a bypass road in the direction of the Slovak border. Do not reach the border - turn left.